For working Macs, find your serial number as shown. On iPhone or iPad, the serial number is displayed in Settings>General>About. If your Mac is not working, you will need to get the serial number off the case. Laptops generally have the serial number either etched on the bottom case, or inside the battery compartment. Most iMacs have their serial number on the underside of the main stand. Want to sell your Mac, iPad or iPhone without the hassle. Get a quote in seconds and free collection. Sell it simply, safely & swiftly. This device has already been booked in. Before completing this booking, please double check that all the details listed above are correct. To confirm your acceptance of our quote and to book the collection where applicable, click the box to say that you accept our terms and conditions, then click the button below. I have read and accept the mac2cash terms & conditions. Our auditing body ADISA do not approve the use of courier shipping. It is therefore offered outside the scope of the ADISA Certification Programme. I accept full liability for any risk of data loss associated with shipping my device by UPS and understand that transfer of custody occurs at the point of delivery to The Bookyard facility. Your device hardware is insured during shipping. Failed to book in request. Simply enter your Mac, iPad or iPhone serial number and confirm the condition to get an instant quote. If you want to go ahead, enter your address details and to make it super-simple, we'll either send UPS to collect on the day you choose or you can just drop the package into a local UPS Access Point at your convenience. We even generate the shipping label for you so all you have to do is box it up! We receive it the next working day, imediately inspect it just to confirm the condition and then issue payment. Where you choose to have your device collected, note that collections can be from any UK mainland address but must be on a working day (Mon-Fri excluding bank holidays). Your Mac must be boxed, and labeled ready for collection between 9am and 5pm on your requested date. The time of day cannot be specified. We guarantee to pay for fully working, correctly described devices within 2 working days of your collection/drop-off date where your chosen payment method is bank transfer (BACS) or PayPal (standard 3.4% PayPal fee for receiving funds applies). If payment by cheque is requested, we raise your cheque just as quickly but delivery time depends on Royal Mail. Faulty devices take 1 extra working day to process. We guarantee to pay the sum quoted provided the condition and supplied accessories you selected are consistent with the machine we receive. If they are not, we assume this is unintentional and we will offer the current online quote price based on the device as we received it. The mac2cash.com web site is operated by The Bookyard Ltd., the Mac recycling & refurbishing company, and supplier of Apple service spares to the consumer market and repair industry worldwide. Established in 2006, The Bookyard is a family run business with the core values of service and integrity. It was set up to supply quality tested Apple service spares to consumers and independent computer repair companies by re-using parts from otherwise faulty Macs. Macs have been purchased via The Bookyard web site since 2006 and mac2cash.com simplifies and automates the process to meet the growing demand for both parts and quality refurbished Apple products. In 2018 we became fully certified by ADISA, the gold standard for the IT Asset Disposal industry, obtained ISO9001 certification and implimented a comprehensive GDPR compliance program. We take your data security very seriously and we are certified and audit by ADISA, the gold standard for the IT Asset Disposal industry. For full information on our GDPR compliance, data protection and privacy policies, see our privacy page. We guarantee that personal data on your machine will not be accessed in any way but will be securely erased and overwritten imediately once your payment has been authorised, using a 7-pass overwrite algorythm exceeding the DoD 5220.22-M specification. Where required for corporate compliance, media can be erased using Blancco 5 and a closed system certificate of data sanitisation provided. Your contact details are used solely for the purpose of collecting and paying for your machine, and will never be used by us for any other purpose or passed on to any other company unless the machine received is believed to have been stolen. We take a hard line on theft and work pro-actively to identify stolen machines by checking the serial number of every device booked in on mac2cash against CheckMEND, the largest database of lost or stolen devices in the world which is used by the UK Police force. If any serial number is flagged as stolen, all details will be forwarded to the Police. Do I have to send you my Apple product before getting paid? Yes you do. We have to verify that the device is as described before sending payment. 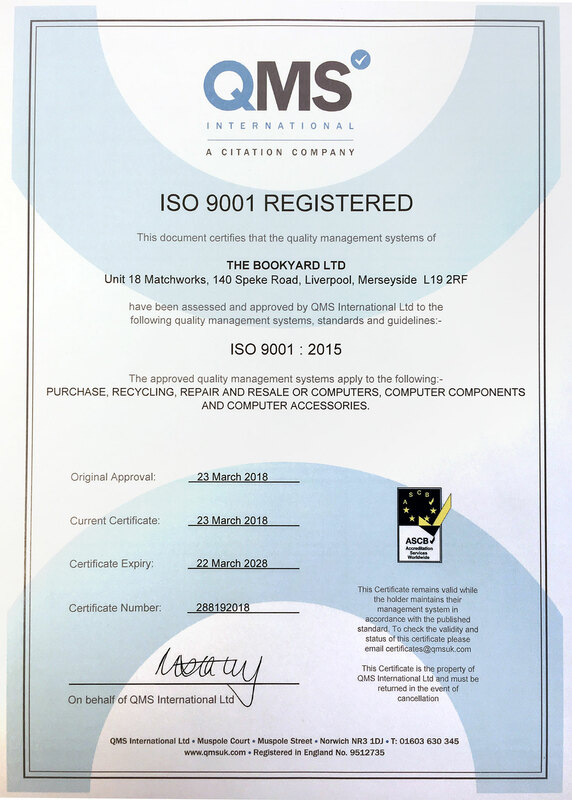 We realise this requires a degree of trust but The Bookyard is a established and widely respected company and we would not risk damaging our reputation by being anything other than trustworthy and reliable. If in doubt, google thebookyard! Does my Apple product have to be fully working? No. One of the great things about mac2cash is that it is run by The Bookyard, an Apple recycling company and specialist Mac parts supplier. We can therefore buy Apple Macs, iPads and iPhones in pretty much any condition and strip them down for parts. You obviously won't get as much but our instant quote system allows you to specify three levels of fault in addition to fully working so that we can give you the best price. Will you pay the sum quoted? Yes. Provided you have selected the condition and accessories supplied options that best describe the Apple product we receive from you, that the product is complete and not an assembled collection of faulty parts, and provided it is received by us within 24 days from booking in, we will always pay the sum we quoted when the device was booked in. Even if there is a minor discrepency, we take the view that this was probably unintentional and usually still pay the quoted amount as we have no intention of playing games or upsetting our valued customers. Obviously if there is a significant discrepency then we reserve the right to re-quote as I am sure you would expect. See our FAQ on most common reasons for requoting. Please note that where payment by PayPal is chosen, PayPal will deduct their normal fees (typically 3.4%) for receiving money from the sum we send. Will I get paid in 48hrs? You can be paid within 48hrs of collection but this depends on four things; your chosen payment method, whether your Mac is faulty, whether you accurately describe it and whether we have to pre-ship you an original Apple box for the shipment of larger Macs. In most cases your Apple product will be working, correctly described and sent in your own box. In this event, payment will be actioned within 48hrs of your chosen collection date. If you requested payment by PayPal or bank transfer (BACS), the funds will reach your PayPal account imediately but if you asked to be paid by cheque, we have to post it so it may take a couple of extra days to get to you. Faulty Macs require one additional working day to assess. Pre-shipping a box to you will add 2 working days. Inaccurately described products will delay payment until we are able to agree a resolution with you. Is this the best price I could get? Probably not. If you are prepared to sell your Apple product on the open market i.e. eBay, you may well get a higher price. Our service is designed for those who don't wish to, or know they will never get around to selling privately and want a quick, simple and risk-free way of selling their Apple product. Having said that, being an Apple specialist, we pay higher rates than general computer trade-in sites. What do the four different working condition options mean? "Fully working" means there are no electrical faults or mechanical faults that affect the functioning of the machine, that it is safe to use & stable when running, and that all ports and drives are fully working. "Booting but faulty" means that the machine starts up and loads the operating system (OS) OK but there are known faults. This would include faulty optical drive, broken or significantly blemished LCD panel, iPad or iPhone with cracked screen/digitiser, broken laptop hinges or a malfunctioning keyboard but would exclude major logic board (motherboard) faults such as faulty RAM sockets or graphics chips. "Not Booting" means either the machine is completely dead or it powers on but will not load Mac OSX/iOS and operate normally. This category excludes any device that has had liquid spilled on it. "Liquid Damaged" covers all devices that have any kind of fault and have been subject to a liquid spill. The price offered is the lowest tier because liquid can cause extensive damage to almost all internal parts. Please be honest in your assessment. All machines are inspected and tested before payment so inaccurate descriptions may result in you being re-quoted and will delay payment. What are the most common reasons for re-quoting? Faulty optical drive : The optical/CD drive is one of the most common items to fail in a Mac because it has moving parts and is prone to getting dust in. When they fail, they often start with the higher level functions first such as DVD burning and since many people don't use that function, they may not have been aware of the fault. Unfortunately, even if the optical drive works for some functions, if it is faulty in any way then we could not sell the machine as fully working without carrying our a repair and fitting a new drive and so if the machine has been booked in as fully working, we will requote as 'Booting but faulty'. Not Excellent Condition : Although we are lenient on the subjective matter of cosmetic condition, when someone has specifically booked a machine in as excellent condition, we expect it to be in great shape. If it has dents, cracks, significant scratches or scuffs, we will downgrade the cosmetic condtion and requote. The 'Excellent Condition' option is there to reflect the fact that in the parts market, case parts rarely sell unless they are A-grade so we reflect the additional value by offering a higher price. Wrong system disks : If a machine is booked in as coming with Retail sysyem disks but only comes with the disks it shipped with, we will remove the value of the retail dists from the quote. The system disks that ship with Macs can generally only be used on that generation of machine whereas upgrade and full system instals that are bought separately from Apple are special generic versions which will install on any machine capable of running that system version. Consequently these 'Retail' versions are much more valuable and our quote system reflects this. Cracked Screen/Digitiser : If an iPhone or iPad is booked in as fully working but the screen glass is cracked, we will requote as 'Booting but faulty'. This is because the digitiser is a functional part of these devices and a crack in the glass presents a risk of injury so would have to be replaced before it unit could be sold as fully working. Do I need to have the original box? No you don't, but large desktop Macs do need to be shipped in an original Apple box with inserts and so we would have to pre-ship a box to you. You will be informed during the quote process if this is the case. All other Apple products must be packed in a suitable strong box if the original box is not available. Detailed packing guidelines will be emailed to you when you complete the booking. PLEASE ensure you read and follow these instruction. Products damaged in transit due to inadequate packaging will not be covered by insurance. Why can't I specify the hard disk & memory size? We designed mac2cash to be as simple and quick to use as possible by only asking for information that will significantly affect the price we offer. Because demand and resale value for used memory and hard disks is relatively small and they therefore would not affect the price we would pay, we do not ask you to specify them. Can I specify the time of day for collection? Unfortunately the time of collection cannot be specified and can be any time between 9am and 5:30pm on the requested day. Someone must be in during those times to hand over the box and so please specify an address and date when this will be possible. If this is not possible you can select the UPS Access Point option which is where we still pay for the shipment and supply you with the label, but you can drop the package off at your local UPS Access Point at your convenience. If there is no local UPS Access Point, consider collection from a work, friend or family member's address. Can I leave the box in a garage, shed, neighbour, under a plant pot etc? No. To ensure the safety and security of your Mac, iPad or iPhone, if you choose the collection option, someone MUST be in at the specified collection address on the requested day to hand over the box in person to UPS. If this is not possible you can select the UPS Access Point option which is where we still pay for the shipment and supply you with the label, but you can drop the package off at your local UPS Access Point at your convenience. If there is no local UPS Access Point, consider collection from a work, friend or family member's address. Will the UPS driver give me a receipt? If you use the UPS Access Point option, you will be given a receipt when you drop yoru machine off. If you use the Collection option, the UPS driver will normally not provide a receit. It is usual for the major courier companies not to issue receipts because the moment they scan the barcoded label on the box using their hand held computer, the collection data is transmitted live to UPS' system along with the time and GPS location. This will show on the tracking information for that parcel. Can I send my Apple product to you myself? Yes you can. If you don't want to use the Collection or UPS Access Point options, just select 'I will send' from the collection date drop-down list when entering your details. This allows us to trade-in machines from remote areas and outlying islands of the UK. Products sent to us are shipped at your own risk and the quote price is only valid for 24 days. All Macs are booted from an external test drive during inspection and we do not access any data on your hard disk or SSD. Once payment has been approved, your hard disk or SSD is securely erased if it is fully functional, or physically destroyed if faulty. Hard drives are erased using software to execute a 7-pass multiple pattern overwrite algorythm which exceeds the requirements of the US Department of Defense data sanitization standard (DoD 5220.22-M). Once complete, data recovery is not possible using any software tool and the drive will then be re-used. Can I book in lots of devices? It depends on how many. The service and pricing offered my mac2cash is aimed at individual machines. If you are booking in more than 5 of any category of device (desktop, laptop, tablet, phone etc. ), you should either contact us to confirm pricing or visit our corporate IT asset disposal site macITAD.com. How do I de-register my iPhone or iPad? To reduce the threat of theft, iPhones and iPads can not be erased or reset without the permission of the iCloud account holder to which the device is registered. To de-register from the device iteself, go to Settings, then iCloud, then Find my iPhone, then turn off Find my iPhone. This will require you to enter your iCloud/Apple ID password. To de-register from another device or computer, go to www.icloud.com and log into your iCloud account. Click the Settings icon and then select the required device from the My Devices section. From the list that appears, click the X by the device to de-register from your iCloud account.